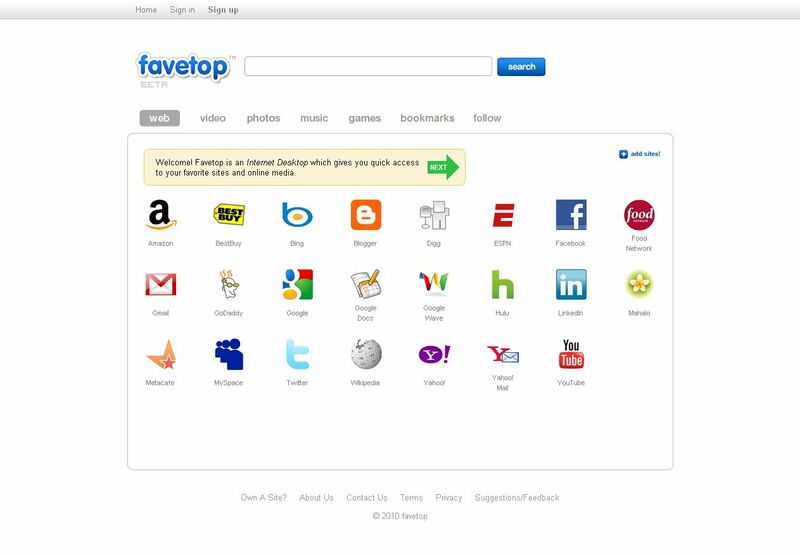 Those who browse a lot should compulsorily know about favetop beta. The sites which we visit the most can be bookmarked and a list can be formed. There are many more facilities. Web tube is created to get the web services at one place like the desktop icons. Gmail, twitter, yahoo mail, you tube etc are available by default. We can add the needed sites by clicking on the add sites button. By typing the site address and click the continue button. Share and recommend buttons can be used to share the website with others. We can watch a video by clicking on the video tape option. In you tube, we can add the wanted videos by clicking on the add video option and writing the embedded code. We can browse and upload the photos by using the photo tube option. By using the embed code, we can make a play list of the songs in music tube. We can bookmark the sites in the bookmark tube. We can play games from the games tube and can add new games by embedding the code. The data in the favetop can be shared with others using the follow tube. Invite your friends option can be used to add friends. Share this option is used to share the data with the followers. We can search the required videos, photos, music, games etc by search option. By using settings option in menu bar and we can delete the unwanted content. We can access the mail by using mail service option. By selecting the messages menu, we can mail to the followers easily. « How to edit the video files and edit the image files online? | Free online video editing websites	» How can we join the different videos which are in different formats?